The 2018 Ford EcoSport is a sporty, family-friendly small crossover and a smart alternative to old-school sedans. Why Choose the 2018 Ford EcoSport? This all-new small crossover is the total package. With two roomy rows of supportive seating, perfect for families and commuters alike. The EcoSport also delivers a long list of modern creature comforts to enhance your family road trips, including leather upholstery and dual-zone climate control. With heated front seats, you can ward off the chill on a frosty morning. Standard tech features, including Apple CarPlay and Android Auto, keep you connected throughout your travels. Every EcoSport also comes with two USB ports, so it's easy to keep devices charged. And, with optional all-wheel drive, the flashy EcoSport helps you maintain precision on winding roads and wet pavement. Does the EcoSport Get Good Fuel Mileage? The 2018 Ford EcoSport strikes an excellent balance between peppy power and modern fuel economy. 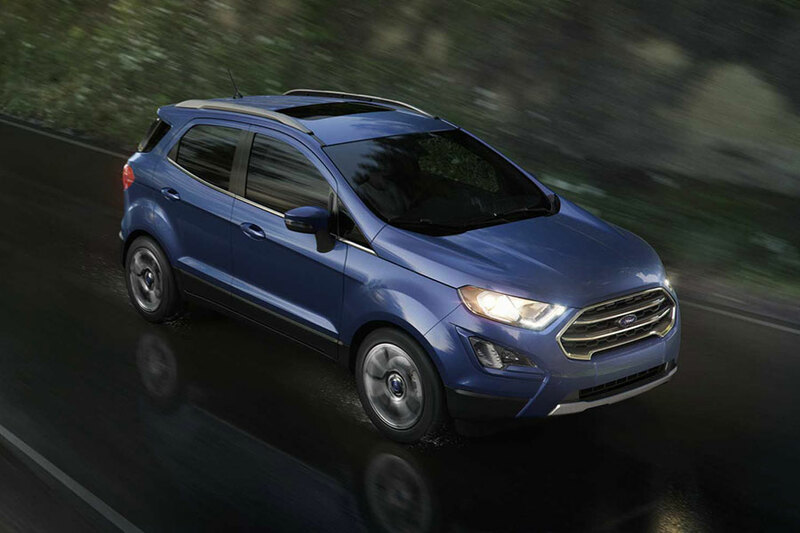 With front-wheel drive, the EcoSport earns 27 city/29 highway mpg. You can add all-wheel drive to your EcoSport for increased traction on wintery pavement. However, as this performance gear is heavy, it reduces EPA ratings slightly, to 23/29 mpg. Is this Small Crossover Safe? In government crash tests, the EcoSport earned an impressive four out of five stars for overall safety. This modern crossover also offers a number of safety aids to help you maximize visibility. These include an optional blind-spot monitoring system, which helps you switch lanes on a busy highway by notifying you when a vehicle enters your blind spot. The EcoSport SES and up come with an auto-dimming rearview mirror, so you can avoid headlight glare during your nighttime travels. All EcoSports come standard with a rearview camera, which displays any pedestrians or bicyclists in your path before you back out of a tight spot. What Features Does the 2018 Ford EcoSport Offer? The all-new EcoSport is stocked with all the latest comfort, convenience, and tech features. For example, the EcoSport SE and up include keyless entry and ignition, getting you off to a stylish start. All but the base model come with dual-zone automatic climate control, which does an excellent job of maintaining two distinct temperatures for driver and front passenger. Every single EcoSport comes with Ford's latest infotainment system, Sync 3. It includes an 8-inch touchscreen and Sync voice controls. These options make it easy to sort through infotainment options without getting distracted from traffic. Sync 3 also includes Apple CarPlay and Android Auto capabilities to display smartphone apps on the central touchscreen.